How to renew the subscription of a company? The subscription of one of your companies will expire soon and you want to increase your subscription. Click on “Renew” in the company button on the “My companies” page. Accept the terms of services and confirm to review your order. Make the payment on Postfinance website. Or jump directly to the Renew subscription troubleshoot. 1) On the “My companies” page, click on the “Renew” button in the company you want to renew. 2) You are transferred to the “Renew my subscription” page. First you need to choose your subscription plan. 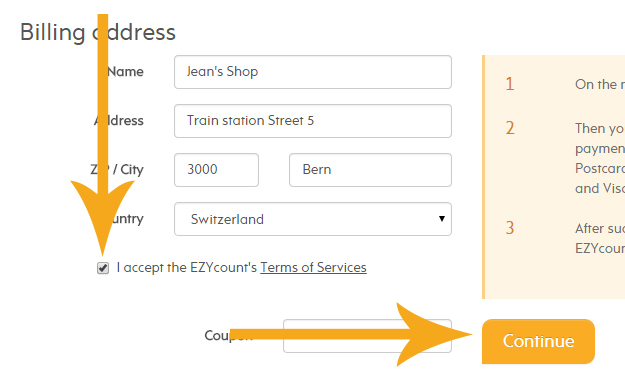 All functionality of EZYcount are included in each plan. The only difference is the length of the subscription. We reward you if you subscribe for a longer period. The monthly cost is cheaper for longer subscription. 3) Edit your billing address. Name: The name of the company or person you want to be written on the invoice. Address: The address you want to be written on the invoice. ZIP / City: The ZIP and City you want to be written on the invoice. Country: The country you want to be written on the invoice. The voucher is calculated in your order when you click on “Continue”. The detailed calculation including your voucher is then available on the next page. 5) Accept the terms of services and confirm to review your order. 6) Review and confirm your order. Review your order and continue to the payment by clicking on the “Confirm” button. If you want to change something on your order, simply click on the “Edit my order” button. 7) Make the payment on Postfinance website. First choose your payment method. Currently there are four payment possibilities: Postcard, E-finance Postfinance, Mastercard and Visa. When you select your payment method, you are automatically moved to the next step, where you can input the detailed information regarding your payment method. Input the data related to the payment method. Click continue to confirm your payment. At any time you can go back to choose another payment method or cancel the payment. After the payment, you are automatically redirected to EZYcount and the invoice is sent to your email address after a couple of minutes. You successfully renewed your subscription!